3 What are the Symptoms of Indigestion? 4 What are the Causes of Indigestion? Indigestion is also known as dyspepsia it is a term that refers to describe discomfort in your upper abdomen. This situation is very familiar. Everyone suffers from indigestion at some point and it is associated with bad eating habits. It is not a disease but it can cause some symptoms such as fullness soon after start eating or abdominal pain. Homeopathic mode of treatment gives natural and effective solution for indigestion. In homeopathy, homeopathic medicines can treat acute as well as chronic cases of indigestion. It is because the remedies aim at treating the underlying cause of the problem and bring about complete cure. Homeopathic remedies for indigestion are chosen on the basis of individual symptoms in every case. There are a number of symptoms which are accompanied by indigestion including belching, bloating, abdominal fullness, heartburn, vomiting and nausea. Homeopathic medicines are natural and treat all these symptoms and they are devoid of side effects. Homeopathic remedies for dyspepsia act well to cure the symptoms of both acute and chronic dyspepsia. Lycopodium, Carbo Veg and China are the best homeopathic medicines to cure indigestion in a natural way. Carbo Vegetabilis is the best homeopathic medicine for indigestion when there is upper abdominal fullness and discomfort. Excessive gas is present in the upper region of the abdomen with distension. Cramping and aching pain are present in the upper abdomen of the person. Burning sensation may also present with the above symptoms. Pain and abdominal discomfort get worse after consuming food. Belching that is empty, bitter, of gas, sour or offensive smelling substances are also there. Belching provides relief to gastric issues. Nausea and aversion to food and problems that become worse after eating the simplest food can be cured with the help of this medicine. China is another natural remedy made from the dried bark of the plant known as Cinchona Officinalis. It belongs to Rubiaceae. It is prescribed for the cases of indigestion with flatulence and distended abdomen. The whole abdomen of the person is distended and bloating because of obstructed gas. This situation arises after the intake of food or drink. Motion provides relief to the distention of the abdomen and excessive rumbling in the abdomen is also experienced because of flatus. The person may experience a sensation of heat in the abdominal region. There is a lack of appetite because of the distension and fullness of the abdomen. Homeopathic remedy China works well in cases of indigestion where the consumption of excessive milk, tea and fruits lead to indigestion. Lycopodium is made from the spores of a plant called Clubmoss. It belongs to Lycopodiaceae. It is an ideal homeopathic remedy for indigestion when the patient suffers from abdominal fullness soon after eating. The formation of gas with bloating of the abdomen occurs instantly after consuming even a small quantity of food. There may be rumbling and gurgling sound in the abdomen is also present. Gas also causes abdominal colic. Rubbing the abdomen may give relief to the pain. Burning sensation in the stomach may occur and it extends to the throat. Vomiting of food, bile or sour substance may also occur. Food that gives rise to indigestion are onions, beans, cabbage, wheat and farinaceous food. Homeopathic medicine Ipecac is made from the dried root of the plant Cephalis Ipecacuanha. It belongs to Rubiaceae. It is an ideal homeopathic medicine to treat indigestion attended with nausea. Nausea is almost persistent. Vomiting of watery fluid may contain white mucus. Weakness and fainting may occur with vomiting and nausea. There is an excessive accumulation of saliva with empty eructation. Cutting pain or distress in the stomach may also be observed. The tongue of the patient looks clean. Iris Vers is made from the root of a plant called blue flag. It belongs to Iridaceae. This homeopathic remedy gives natural cure for indigestion when it is attended with a burning in the stomach. The burning may increase to the food pipe and throat of the person. It is accompanied by vomiting especially after consuming food. Vomiting may of the food which has just been eaten or sour in nature. Iris Vers is the best homeopathic medicine for headache/migraine that occurs due to gastric problems including indigestion, acidity, sour vomiting and nausea. Homeopathic medicine Robinia is made from the fresh root and young twigs of Robinia Pseud-Acacia plant. It belongs to Leguminosae. It provides natural cure to indigestion. The main symptom that indicates the usage of this medicine is indigestion with heartburn and sour vomiting. Furthermore, it is also one of the best homeopathic remedies for GERD (Gastroesophageal Reflux Disease). Vomiting and heartburn become worse at night on lying down. It is associated with nausea. Along with the above symptoms, the person also experiences fullness and weight in the stomach. Furthermore, dull pain in the stomach is also present frequently after having meals. Homeopathic medicine Nux Vomica acts well in cases of indigestion when it occurs after consuming spicy food or excessive alcohol. The prominent features to take into consideration are sour/bitter belching, sour mucus with retching and heartburn. Vomiting of ingesta, oily matter, bile or mucus that is our in nature is there with retching. The epigastric region of the abdomen is bloated, full after having food with a sensation of pressure. Cramping pain is also present in the stomach of the person. Furthermore, the loss of appetite is also present and the stomach region is sensitive to pressure. It is also prescribed for dyspepsia that occurs due to mental worries and belching of gas. Homeopathic remedy Asafoetida is another natural remedy to cure indigestion when abdominal distension is present with loud belching. The patient of this medicine complains of excessive gas in the abdomen with pain and distension. The gas travels to upward and gets out from the mouth as belching. The belching of the patient are loud and offensive in nature. Gas rolls in the stomach of the person and creates a gurgling sound and gets out in the form of loud belching. Pressing or cutting pains in the stomach may experience and pulsation in the pit of the stomach may also be observed. The patient feels disgusted towards all kind of food and heat in the abdomen is also there. Antim Crudum is ideal remedy to treat indigestion with belching tasting like food. In addition, the patient also experiences burning at the pit of the stomach. 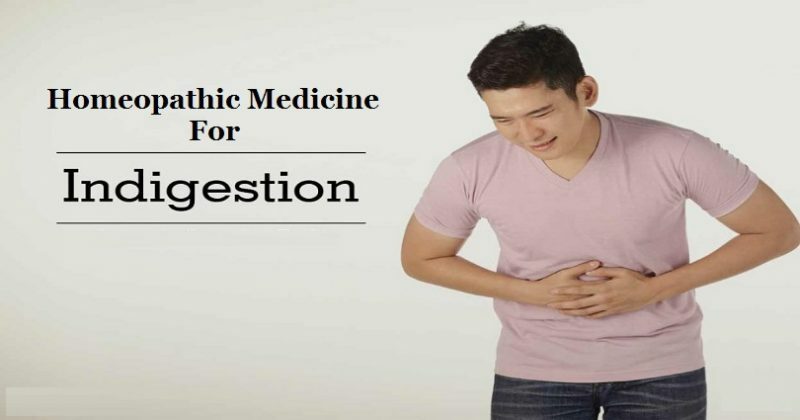 Nausea and vomiting with the sensation of overloaded stomach, pain in the stomach with distension and burning are some important symptoms of this remedy. The tongue of the person is coated with white gastric disturbances. It is an ideal cure for indigestion when there is a burning sensation in the stomach and vomiting in cases of gastritis. The stomach of the person is sensitive to the slightest touch. Burning is intense in nature. In addition, the patient feels weight in the stomach and the stomach region is also distended. Vomiting occurs with the burning sensation in the stomach and it comes after taking the slightest food or drink. Restlessness and anxiety are some other attending features that may occur. Arsenic Album also works well in cases of stomach ulcers.